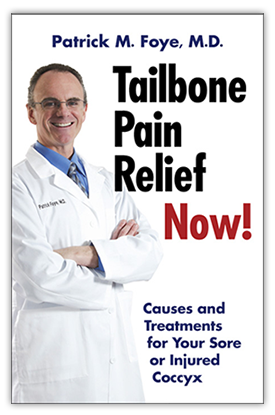 Here is an excerpt from Dr. Foye’s book, Tailbone Pain Relief Now! On February 21, 2019, there was a Live Question-and-Answer session for more than an hour on the Tailbone Pain Center’s Facebook page. Please join the NJ Society of PM&R for a special event this Wednesday, February 20, 2019, at 6pm. The special guest speaker from New Zealand will be Dr. Jason T.K. Woon PhD, MBChB. Dr. Woon is an internationally known lecturer on the topic of coccyx anatomy and coccyx imaging studies. Can you Ride a Bicycle if you have Coccyx Pain, Tailbone Pain? Periosteum of the Coccyx: Tailbone Periosteal Layer and Coccygectomy. Recently I have received a lot of questions about the periosteum and whether the periosteum should be left in place when ppatient undergoes a coccygectomy (surgery to amputate or removed the coccyx, or tailbone). Tailbone Book, Chapter 13: Cancer Causing Coccyx Pain, Tailbone Pain.